The Other Side: Assad Set-up so that Obama would have a Reason to Bomb Syria? There is as yet independently unsubstantiated evidence for the involvement of the Jabhat al-Nusrah al-Qaeda offshoot in the chemical weapons attack in Syria, at least as much or more evidence than there is for the Syrian army involvement. I would ask why Syria would OR the rebels would fire on the UN inspectors after Syria invited them in (and, as the West claims, already had time to clear the site of evidence). The rebels would absolutely benefit from “proving Syria’s guilt”. 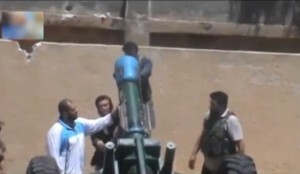 A screen shot from a video purports to be Syrian Rebels preparing a WMD attack. In addition, who is it that wants the West to attack Syria? Certainly not Syria. The Syrians/Iranians/Hezbollah have been defeating the rebels in nearly every serious battle for months now. It’s not at all clear that this attack advanced their goals. What’s the evidence? Who’s the source? Was Obama involved in setting up the justification for an attack, given the ridicule that has followed his lack of action? Did the Muslim Brotherhood help their allies and at the same time take a few shots at Israel, sure that Iran and Syria would be blamed? We know that Saudi Arabia and is allies are providing support to the rebels. Do we know to what extent and by what means? They also want to force the U.S. to attack Syria. There are so many conspirators, all with evil intent. Are there any “good guys” left in power? Or do only the innocent and naive remain to serve as canon fodder in the fight between the religious jihadists and the extreme left for world power. In the linked article, there are claims that will take some time to verify, but at least some of it may be accurate. We used to be able to believe the Western intelligence reports, the US Admin and State Department. That’s no longer the case. They are deeply involved in multiple (illegal) intrigues both at home and abroad and will cover themselves no matter the cost to others. And don’t be taken in by their ‘concern’ for loss of ‘innocent’ life. Do they care about the churches and the Copts in Egypt? Do they care about other minorities being slaughtered in Africa? What about those Christians slaughtered during the Kenya election violence perpetrated by the so-called extended family of Obama (He even visited there and was sending the ‘rebels’ tax money when he was in the Senate – check it out), minorities in Yemen, in Zimbabwe, human rights in China?? So……we are on our own to figure it out. However, it really may not matter who’s to blame; it will matter who the West says is to blame. What will follow the disaster that they are plotting. We are all on the sidelines, but for one thing: It will eventually spillover into our living rooms in Israel and it will eventually take sons and daughters from the West to fight a rabid enemy in foreign lands. Then it will eventually come to your living rooms. May God help us all.